IL&FS Soon to be Bankrupt, What Went Wrong? The Indian Government has reportedly taken control of Infrastructure Leasing & Finance (IL&FS) following the approval from the Insolvency & Bankruptcy Court in Mumbai. The country’s leading infrastructure finance company IL&FS has defaulted on payments to lenders triggering panic in the markets. Infrastructure Leasing & Financial Services Limited (IL&FS) is an Indian infrastructure development and finance company which operates through more than 250 subsidiaries including IL & FS Investment managers, IL & FS financial services and IL&FS Transportation networks India Limited (ITNL). IL&FS is popularly known for building the Chenani-Nashri tunnel — India’s longest road tunnel at 9 km. The company is a complete end-to-end technology solutions company offering consulting, software development, systems integration, data digitization and management service and solutions, performance tuning solutions and IT infrastructure management services to customers all across the globe. The company counts various well-known ventures as its shareholders such as SBI, LIC, ORIX Corporation of Japan and Abu Dhabi Investment Authority (ADIA). IL&FS Financial Services is a group company that has been defaulted in payment obligations of bank loans that included interest. Also, it was defaulted for the term and short-term deposits and failed to meet the commercial paper redemption obligations due on September 14. On September 15, the venture stated that it had received notices for delays and defaults in servicing some of the intercorporate deposits accepted by them. Following the result of defaults, rating agency ICRA downgraded the ratings of its short-term and long-term borrowing programmes. The defaults also threatened hundreds of investors, banks and mutual funds associated with IL&FS. The defaults sparked panic among equity investors even as several non-banking financial companies faced turmoil amid a default scare. IL&FS group’s transport subsidiary called IL&FS Transportation Networks (ITNL) delayed repayment of Rs 450 crore of inter-corporate deposits from Small Industries Development Bank of India (SIDBI). Also, the group defaults on a Rs 1,000 crore term loan and its subsidiary defaults on dues worth Rs 500 crore owed to SIDBI. The group with at least 24 direct subsidiaries, 135 indirect subsidiaries, six joint ventures and four associate companies is having a debt of about Rs 91,000 crore. The defaults by IL&FS have shut it out of the market, leaving it at the mercy of shareholders such as Life Insurance Corp of India, Housing Development Finance Corp, Japan’s Orix Corp, and Abu Dhabi Investment Authority. A group of defaults by IL&FS group companies in August and September on term deposits, short-term deposits, inter-corporate deposits etc results in a massive sell-off in shares of non-banking financial companies (NBFCs). This, on the other hand, creates repayment pressure in mutual funds holding such financial instruments and adversely impacts sentiment in the stock, money and debt markets. 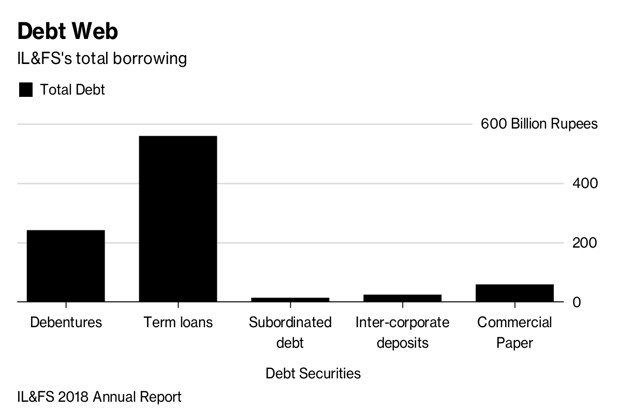 Along with this, it also builds up large systemic risk, leading to good quality debt papers being sold at steep discounts to meet redemption demand. The government has stated that the collapse of IL&FS may lead to a collapse of many mutual fund companies as well.